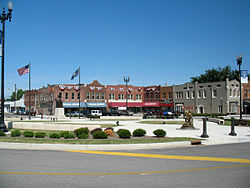 There are 419 cities in the U.S. State of Kentucky that are recognized by the state. Kentucky cities are divided into six classes based on their population. Over 400 classification-related laws affect public safety, alcohol beverage control, revenue options and others. Lexington and Fayette County merged to create an urban county government (UCG) and Louisville merged with Jefferson County to create a metro government. However, Lexington and Louisville retain their pre-merger classification. Click on the double triangles at the top of a column to sort the table by that column. A ^ All but two of Kentucky's county seats are cities. 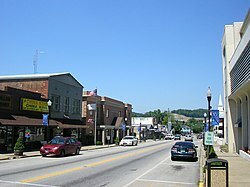 The exceptions are Whitley City, seat of McCreary County and Burlington, seat of Boone County. 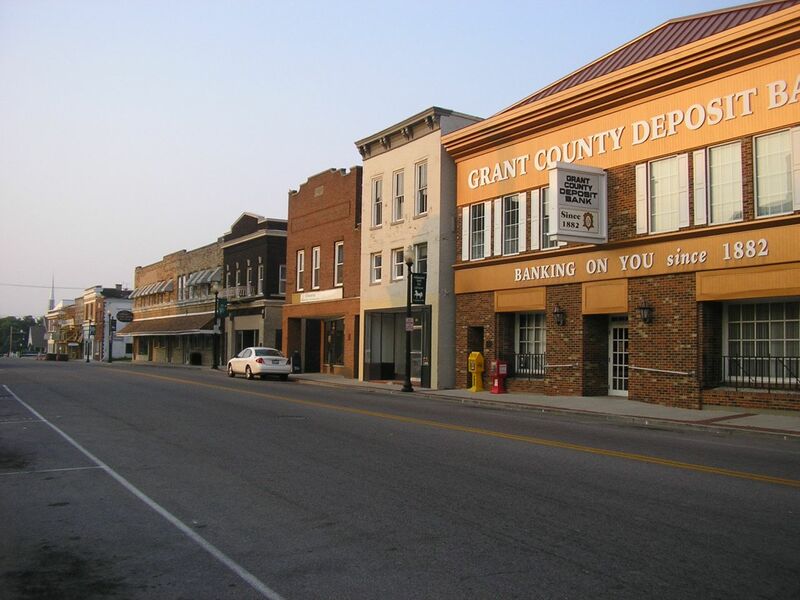 Two Kentucky counties have two seats each -- the seats of Campbell County are Alexandria and Newport, and the seats of Kenton County are Covington and Independence. B ^ Population and area are as of 2000. ^ a b c "Kentucky Cities: The Basics". Kentucky League of Cities. 2010-11. http://www.klc.org/UserFiles/KentuckyCities-TheBasics_2010_Update.pdf. Retrieved 2010-11-13. ^ "Legislation Approved by the 2011 Kentucky General Assembly". Kentucky Secretary of State. http://apps.sos.ky.gov/executive/legislation/%28S%28nk0dyk55b1bviz45hsoyw145%29%29/EnactedLegislation.aspx. Retrieved 2011-05-06. ^ Kleber, John (1992). The Kentucky Encyclopedia. Lexington, Kentucky: The University Press of Kentucky. ISBN 0-8131-1772-0. ^ a b c d e f g h "Kentucky Cities and Counties". Kentucky Secretary of State: Kentucky Land Office. http://www.sos.ky.gov/land/cities/. Retrieved 2010-08-04. ^ "County Seats of Kentucky's Counties". Kentucky Department for Libraries and Archives. 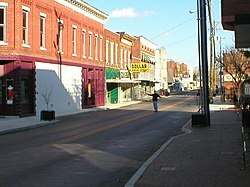 2008-10-07. http://www.kdla.ky.gov/resources/KYCountySeats.htm. Retrieved 2009-03-28. ^ "Kentucky -- Place GCT-PH1. Population, Housing Units, Area, and Density: 2000". U.S. Census Bureau. http://factfinder.census.gov/servlet/GCTTable?_bm=y&-context=gct&-ds_name=DEC_2000_SF1_U&-CONTEXT=gct&-mt_name=DEC_2000_SF1_U_GCTPH1_ST7&-tree_id=4001&-redoLog=true&-_caller=geoselect&-geo_id=04000US21&-format=ST-7/ST-7S&-_lang=en. Retrieved 2009-03-28. This page uses content from the English language Wikipedia. The original content was at List of cities in Kentucky. The list of authors can be seen in the page history. As with this Familypedia wiki, the content of Wikipedia is available under the Creative Commons License.